Several weeks ago April Craig contacted me to share with me the beautiful project she was working on, because she thought I'd be interested in it. Last year, after losing my mother, my heart turn to sentiment. Everything important to me took on greater value, especially my relationships within my family. As I pondered my mother’s life and read from her journals, a desire grew in me to leave something of importance to my children. My mother had an intense love of the scriptures. She taught seminary for years and expressed her love of the scriptures beautifully in the writings of her journals. As a photographer, my creativity is expressed through pictures. I wanted to share with them this amazing legacy my mother had given to me. I thought to myself, what better way to pay tribute to this legacy than to capture in photography those things that were most precious to my mother. Images and ideas began to flood my mind and the book came together quickly. The experiences I had while creating this book were amazing. In the beginning, I pulled models for each page from my circle of church friends which mostly consisted of LDS children and youth. However, as time past, I began to pull models from the community. By the time the book was complete there were 6 different religions represented in the models. How wonderful it was to share this experience with so many faithful youth from so many different faiths. I was continually touched and strengthened by the beautiful spirit the children and youth brought into my studio. This project, although originally intended to inspire my own children to read the scriptures, has turned into something that I hope will inspire many to draw closer to Christ through their scripture study. April sent me a copy of her book and I was very impressed and touched by some of her art work. I was especially touched by her photo of Sarah and Isaac, and can safely say that this is one of my all time favorite depictions of Sarah... EVER. It just makes the miracle of her conception so profound. Some of April's photographs are meant to be realistic (ie. the models are about the age that the real woman would have been) and others are more interpretive (ie. using a child or a teenager to portray a woman), but all of them tell beautiful stories. 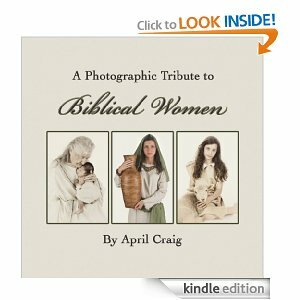 Each page of the book has a different story of a woman from the Bible, along with the scripture reference and a brief summary of the story. It really isn't a book to teach you about each woman, but rather a way to get you familiar with the stories and prompt you to open your scriptures and read their story. This is a book that has gone in our church bag and it has been a fantastic way to start teaching my kids about the stories of the women in the scriptures. The only thing I wish was that the book was a bit bigger because I feel like some of the art work gets "squished out" by the words on the page. The pictures are so beautiful it would be nice to see them alone. But my kids didn't really care about that, they loved it. And I love it that they are learning the stories. Aren't they beautiful? I love all the tiny babies. She said her youngest model was 8 days old! April has offered to give away a copy of her book to one of my readers! If you would like to enter to win please do one or all of the following (each one you do will get you an extra entry). Leave me a comment letting me know which ones you do. 1. Take a peek at the inside of the book by going here and clicking on "Take a look inside". Leave me comment letting me know which picture you liked the best. 2. Share this post on Facebook, Twitter, Pinterest or on your own blog. 3. Visit April's website and share her book on Pinterest by clicking on the "Pin it" button below. Best wishes! The giveaway will close on Monday, October 29th @ Midnight. The picture of Sarah and Isaac is breathtaking! I Pinned the book and I looked at the sample pictures/pages on Amazon- I'm in love! I LOVE the picture of Ruth. She is one of my very favorite scripture heroes, so I was happy to see the noble portrayal of her! I like the Siphrah & Puah picture...have never heard of them and now I am intrigued to look it up during my scripture study in the morning! I love all the pics! I pinned from her site! This is incredible. What an amazing, amazing Spirit! I shared this on Facebook and Pinterest. This is stunning!! 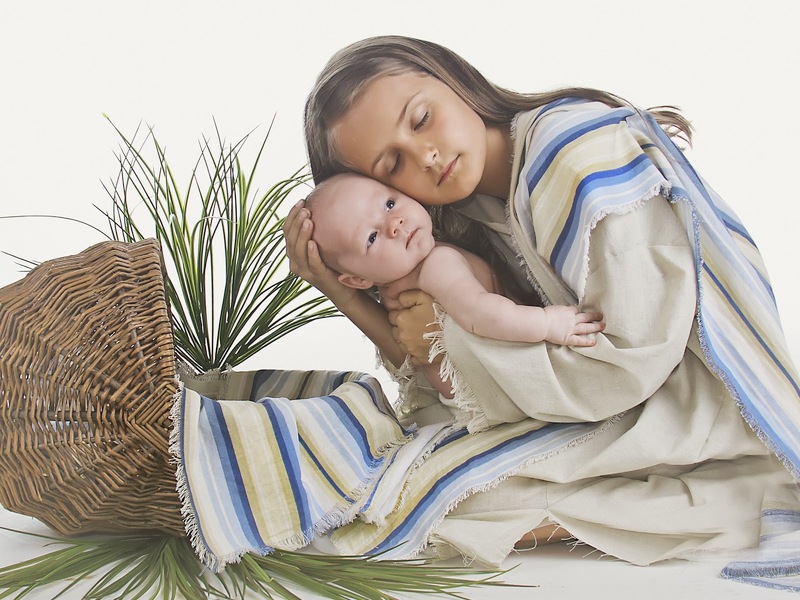 I LOVE the picture of Isaac and Sarah but the daughter of God brought tears to my eyes! I shared this two or three times on facebook and pinned April's website. I shared this on Facebook, pinned the website and had a look at the pictures on Amazon... I'm literally crying! How can you choose?! I love Deborah. She looks so strong, capable, but inherently feminine. Thank you so much for bringing this book to my attention!! I shared on facebook and pinterest. The pictures are stunning. 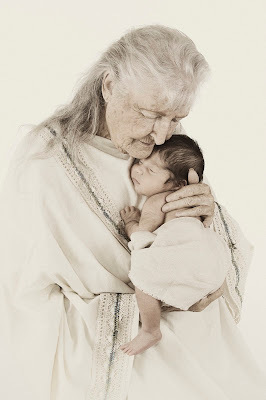 As one who loves and has studied the women in the scriptures, I'm pretty sure this will be one I'll want to have! I really was touched by all the pictures. The tenderness of Sarah and Issac and the sweet face of Miriam holding Moses. Wow! These are awesome! I shared on facebook and pinned on pinterest. I like the one of Deborah. It reminds me that women, too, must put on the armor of God and be valiant warriors against Satan. Shared on facebook and pinned on pinterest. From the book preview I still like the picture of Sarah and Isaac best. It's just amazing. Pinned it, shared it via facebook, and for my favorite photo - I'm really torn! I initially really gravitated to the one of Sarah and Isaac, but was also very move by Leah, the Mother of Nations, right next to Rachel's photo with Jacob. How hard than must've been for Rachel to wait, and wait some more for her son, as she watches her sister have boy after boy after boy, and then even be blessed with a girl. I imagine it the anguish that she might've felt at times, and even some guilt for feeling (envy, sad, resentful), not rejoicing in her sister's blessings. Those two photos side-by-side were also very powerful. How inspired to put these stories to photos! VERY POWERFUL!!!! I think the Sarah and Isaac one is powerful and emphasizes just how much of a miracle Isaac was for her! Love it! The one of Sarah and Isaac really drives home the years of waiting Sarah endured. So amazing. Love it! I loved the pictures of Hannah. Very beautiful and shows the power of prayers being answered. Eve - the mother of all living. What a wonderful project. This book looks amazing! I did all three! I think Miriam and Moses might be my favorite, but it's hard to choose! Sarah and Issac pic might be my favorite but I really loved them all! I also pinned it from her website. Thanks for sharing this beautiful book! This book looks beautiful! I did all three :) Thank you for sharing!! I also shared this via FB and pinned her page. I love the picture of Miriam and Moses. How sweet and innocent! The scriptures are full of strong and loving women. What a beautiful book! I like the one of the Hebrew midvwives. What faithful, God-fearing women they must have been, and truly a Godsend to those Hebrew women they served. I like Deborah, as I have a Debbie and she would love to see a picture of the woman she is named after! I pinned April's book from her website and shared this post on twitter. That is a gorgeous idea, lovely to bring the stories and characters to life like this. Thanks for sharing. Pinned the book and your blog on pinterest. As for my favorite picture... I'm almost overwhelmed by the depiction of Sarah! So beautiful. I think Sarah is my Favorite! I shared this post on my blog today and I love the photo of Rachael...Don't quite know why....but that's the one I like. I had the privilege of helping April with the book and every page is amazing. The spirit took over with all of the models as we placed the costumes on them. It was an experience that I will never forget. Awesome book! My favorite picture is "Woman of Faith"- so much emotion- so much faith- incredible! I *want* to post her page to FB, not for the the chance of winning a copy (I do want a copy!) but to share how wonderful this is. But, FB won't let me. It is saying that zzl.org is "known for being spammy." I'm going to post your page though! pinned the book- ...it is very hard to choose a favorite as there are so many great photos. The hebrew midwives, Puah and Zephrah (sp?) are one of my favorite not well known stories...for their bravery in choosing the right regardless of what the consequences might be. I love this book! I totally want a copy! But I don't have a Kindle, and I prefer actual, bound books with real paper anyway. Is she going to sell a printed copy in the future?